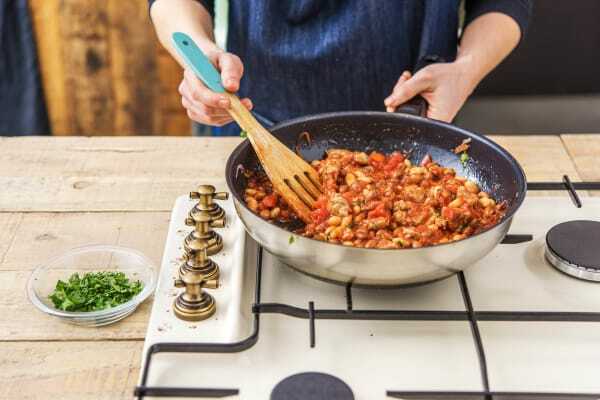 Sausage meat in a chilli? Yes, you read it right! 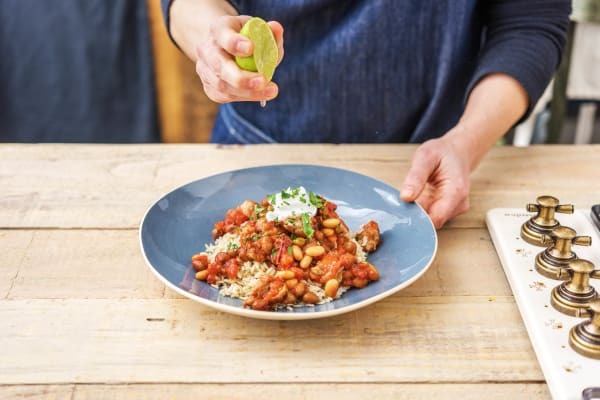 It may be slightly unorthodox, but pork and beans is such a classic combination that we're positive you'll love this alternative to beef mince. Enjoy! Put a large saucepan of water with a pinch of salt on to boil for the rice. 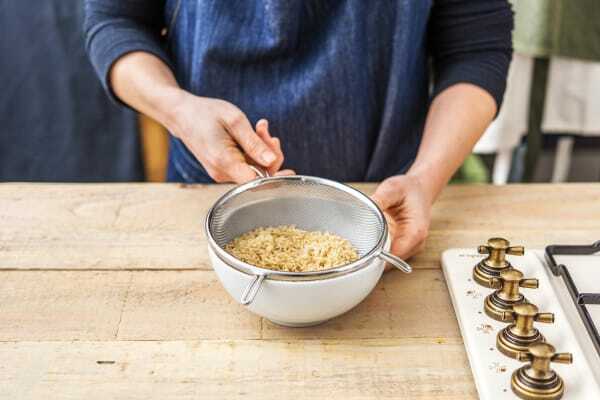 Rinse the rice in a sieve under running water for 1 minute, then add it to your pan of boiling water. Cook until the rice is soft, 25-30 mins. Then drain and return to the pan. Cover with a lid and leave off the heat until the chilli is cooked. Meanwhile, halve, peel and thinly slice the red onion into half moons. 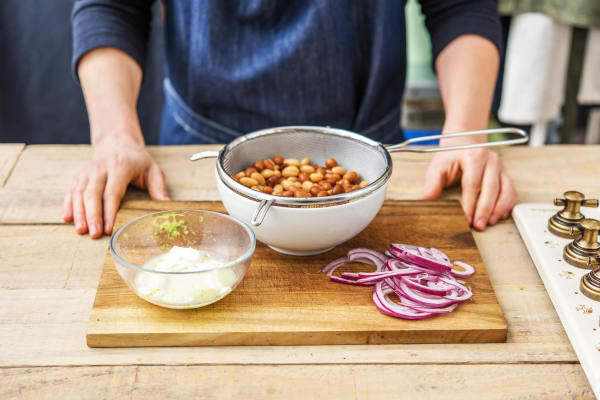 Drain and rinse the mixed beans in a colander. Zest and juice the lime, then mix a pinch of the zest and a dash of juice into the sour cream. Tip: When zesting (i.e. grating) the lime, don't go down to the white part underneath the skin as this tastes bitter. Heat a splash of oil in a frying pan on medium-high heat. Cut open the sausage, remove the meat and discard the skin. Cook the sausage meat until brown. 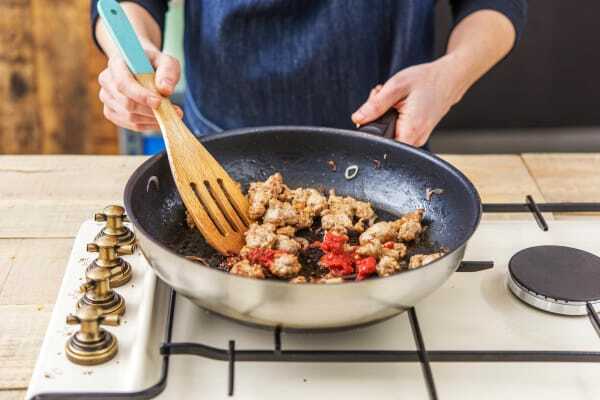 Tip: Use a wooden spoon to break up the sausage meat as it cooks. Add the onion to the pan, along with a pinch of salt and a grind of black pepper. Stir, then cook until the onion has softened, about 5 mins. Add the cumin. Cook until fragrant, 1 minute. Then add the tomato purée and chipotle paste (careful - it's very hot!). Tip: If you have any sugar, add a pinch now. Add the mixed beans, the diced tomatoes and the vegetable stock pot. Stir to dissolve the stock pot and then bring to the boil. Turn down the heat and simmer until the chilli has thickened and reduced by half, 7-10 mins. While you wait, pick the coriander leaves from their stalks and roughly chop (discard the stalks). 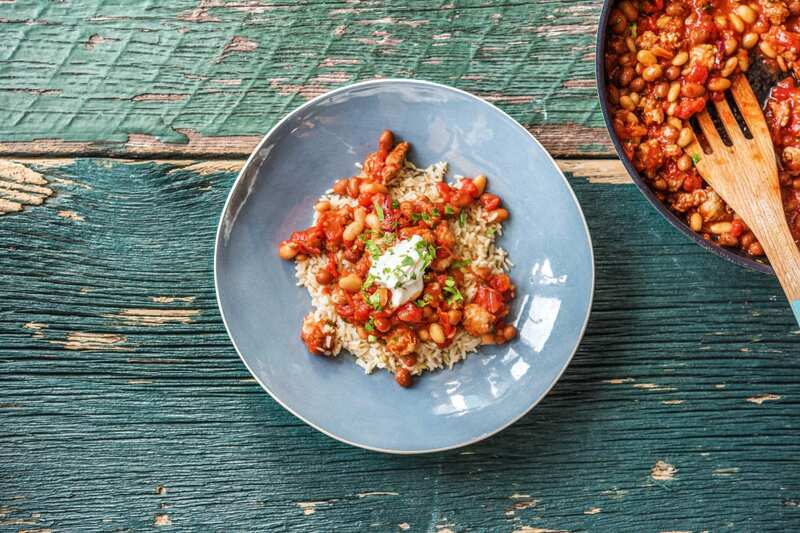 Serve your chilli with the rice, a good dollop of zesty sour cream and a sprinkling of chopped coriander. Squeeze over a bit of lime juice if you like and tuck in!